Renowned master chef, John Myers, brings a wealth of culinary vision and international flair to Eros, with a focus on artfully presented cuisine prepared with the finest and freshest ingredients. We strive to accommodate all preferences and dietary restrictions. Child-friendly menus, late-night snacks, and picnic boxes to go can also be arranged. Our final menu selections are partly determined by the fresh ingredients available on each of the islands we visit, but you can view some of our sample menus here. Your Eros charter crew includes our Captain, Chef, First Mate, Steward, and Deckhand. All crewmembers are licensed full-time professionals, certified by the U.S. Coast Guard. Their love for sailing is matched by their steadfast commitment to your safety and comfort. Capt. Alastair Doyne-Ditmas hails from the United Kingdom, where he was educated at Nautical College and served in the Royal Navy Reserve. His first service employment was as an assistant boatman to Cliveden, Lord Astor’s stately home. A professional yachtsman for twenty nine years with a specialty in wooden yacht construction and design, he brings a calm and informative presence to the vessel he commands. All guests, and especially families and children, find themselves welcomed with open arms in the knowledge that their safety and comfort are of highest priority. His experience and familiarity with Eros’ cruising grounds promise a spirit of adventure, enjoyment and security. A native of the Philippines, Wilson’s work as a research technician in Biotech brought him to the US in 1999. He spent most of his free time climbing the Sierra Nevada Mountains and sailing on the San Francisco Bay. Wilson has sailed extensively in California, Mexico and the Caribbean as both crew member and skipper. He joined Eros in 2012 for a charter season in the Caribbean which included the voyage from San Francisco to St. Thomas, Virgin Islands via the Panama Canal. A consummate professional whose love for Eros matches his passion for sailing, Wilson takes great pride in her care and upkeep. Dedicated to pleasing guests and captain alike, he is beloved for his cheerful and welcoming disposition. Renée brings 20 years of hospitality and catering leadership to Eros, where she combines her talent and professionalism with her love for sailing. A product of California’s food & wine entertainment boom, she has managed countless affairs through the years, from high-profile corporate and public events to intimate private dinners. Her attention to detail, style and simplicity reflect her early background in TV advertising production. 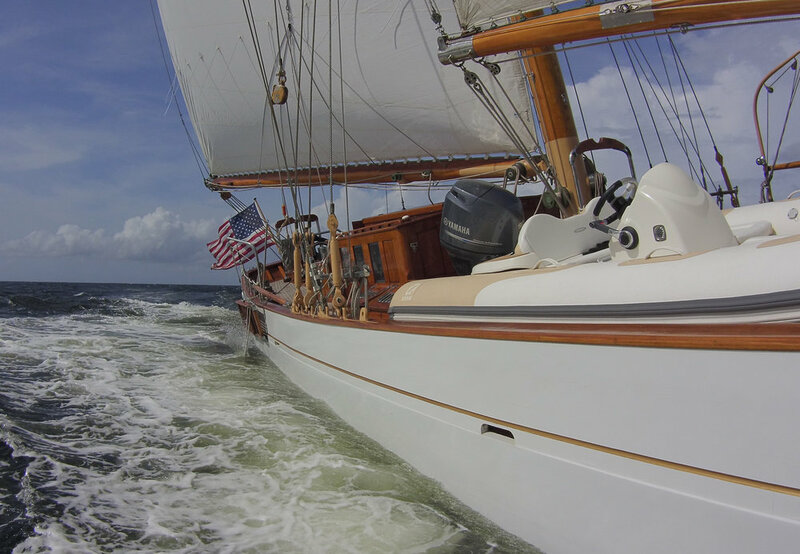 No stranger to the sailing world, her yachting hospitality credits include the Presidential Yacht, Potomac, America's Cup, Moet Cup, Louis Vuitton Cup and the Mayor's Cup Yacht Races in Newport, RI. Her warmth and conviviality, combined with a passion for world travel, make her at home with Eros guests from around the world, from our youngest to our most seasoned travelers. Renée is eager to learn her guests’ favorite items so that she can prepare Eros for your arrival in the most personal way.